We’ve put together a bunch of information to help you shop for the best mattress deal in or near Mesa, AZ. Good luck with your mattress shopping! A mattress represents an investment in your health, comfort, and quality of life. How important is having a good mattress? You can expect to spend a full third of your life sleeping on it, and if you read, watch movies or unwind in bed, that number could be even higher. Sleeping or relaxing on a sub-par surface is likely to lead to back pain and poor quality rest, so it makes sense to invest in mattress constructed with sufficient support and comfort. Mattress age counts as well. A good-quality mattress can last up to 10 years, while more basic models should be replaced every 7 years. Exactly what type of mattress you’ll want to buy depends on your budget, body type, and comfort preferences. Today, there are more mattress types than ever, from traditional coil models, to economical and ergonomic foam, to innovative options like temperature-regulating gel. If you’re a fan of natural products, there are organic mattresses, and tech lovers can purchase adjustable or sleep-tracking mattresses. With all the choices available, you may be wondering where is the best place to buy a mattress in Mesa? We’ve got you covered. We’ve combed the online reviews to find the best places to buy a mattress in Mesa, all grouped by neighborhood. Read up to conveniently find the mattress of your dreams. Bargain-hunters can score a great deal on a pre-owned mattress at two Central Mesa locations of Mattress Firm Clearance (2154 E Baseline Rd, 1464 N Cooper Rd). Mattress Firm is the nation’s leading mattress retailer, and its clearance centers specialize in name brand mattresses at deeply discounted prices. Many are floor models or mattresses with cosmetic imperfections, but the majority are mattresses returned by customers within the store’s 100-night “sleep happy” return window. Both locations boast a 5-star Yelp average rating, with shoppers reporting excellent customer service and serious discounts on top-of-the-line brands like Tempur-pedic. Another mattress store in central Mesa with top ratings in Brooklyn Bedding (20 W Baseline Rd), which also garners 5 stars in Yelp reviews. This chain has been in business since 1995, manufacturing there own line of highly economical and high quality mattresses. Their Central Mesa store features a spacious and sleek showroom, knowledgable staff, and affordable mattresses. Brooklyn Bedding also offers a 25% discount to military members, a 120-night trial period, and free shipping and returns. One of the highest-rated places to buy a mattress in Northern Mesa is Mattress Firm Mesa Riverview (1003 N Dobson Rd), which boasts a 4.5-star Google rating, as does Mattress Firm Ridgeview (6744 E McDowell Rd). Mattress Firm has earned a solid reputation and dominates the national mattress scene, with a focus on expertise in sleep consultation. Store staff (aka “sleep experts”) are trained to provide guidance without exerting sales pressure, and are trained to help resolve sleep issues (such as insomnia, back pain, and sleep apnea) by matching customers to the ideal mattress for there body type and health concerns. Another mattress store in central Mesa with an outstanding reputation is American Freight Furniture and Mattress (4422 E University Dr), which has a 4.8-star average customer rating on Google. As the name implies, this branch of the national chain sells furniture as well as mattresses, and stocks popular brands like Simmons and Nordic mattresses at prices as low as $39. Along with a new and affordable mattress, shoppers at this store can pick up a new bed or bedroom set as well. There are very few places to buy a mattress in South Mesa, but Arizona Mattress Outlet (91 N Val Vista Dr) is a popular and reputable option in the area. The store stocks innerspring, pocket coil, memory foam, cool gel, pillowtop, and latex mattresses, from top brands like Sealy, Simmons, Serta, Stearns & Foster, Sleep to Live, Kingsdown, and Tempurpedic. This family-owned local chain boasts steeply discounted outlet prices, up to 80% off retail. Arizona Mattress Outlet specializes in mattresses from overstock, discontinued models and those with slight cosmetic blemishes, and the inventory turns over frequently, making this store a good match for bargain hunters who have flexible comfort and style preferences. Mattress shoppers in East Mesa have just one destination available: Mattress Firm Mesa (1826 S Signal Butte Rd). Fortunately, this store has an excellent reputation, with a 4.5 star average rating on Google and a 5 star average on Yelp. Buyers here praise the store’s staff for warmth, professionalism, and expertise, and give top marks for excellent pricing on markdown models. 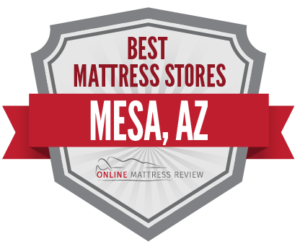 That wraps up our guide to the best mattress shops in Mesa, Arizona. We hope you find that perfect night sleep!